The Decline of the Gentleman Scientist and it’s Effect on the Public Awareness of Planet X. 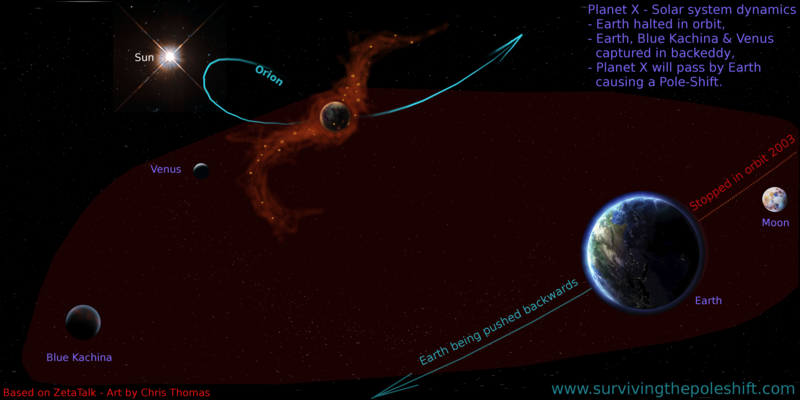 Earth is stopped in orbit by the powerful influence of Planet X. The STO Zetas of ZetaTalk explain that planetary orbits are “not sacred”, they can be altered if sufficiently powerful forces are in play. Earth is held in its circular orbit around the Sun by other solar system dynamics: a balance of gravity-attraction and repulsion-forces. The anti-clockwise orbit of Earth is maintained by the sweeping arms of our rotating central star, but when an orbiting planet encounters a dense brown dwarf near it’s orbit-path, it has no choice but to halt. Earth also has a counter-orbiting buddy, a dead twin (Earth’s Dead Twin – EDT) which is the Hopi “Blue Kachina”. We see it occasionally now because when Earth halted in it’s orbit, EDT continued from it’s 180 degree position opposite of Earth and came up to stop behind Earth. 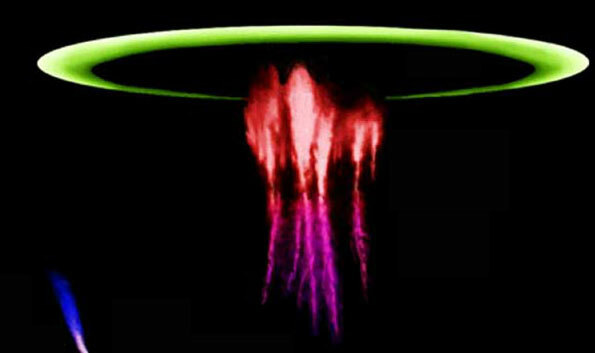 So since about 2004, Earth, EDT and Venus have been captured in a particle-flow “cup” – graphically represented as the faint red enclosure. Gentleman scientist Alexander Graham Bell demonstrating his “telephone” at the Centennial Exhibition in Philadelphia on June 25, 1876. 1850 – The SS Baltic was a wooden-hulled sidewheel steamer built in 1850 that operated between New York and Liverpool. It was the fastest and most luxurious transatlantic steamship of it’s day crossing the Atlantic in slightly less than 10 days. This was before the days of telephone and travel was very slow, thus a gentleman scientist in those days depended very much on his own deliberations. A gentleman scientist is a man so dedicated to his scientific interest in a subject that he embarks on a path of study and experimentation based on scientific principles, such as mathematics, chemistry or astronomy under his own financial steam. This expression characterizes the early scientists in the modern age of “western” science that began sometime in the 1600s. In the meantime, I have no doubt that there were many private men of science in other countries not noted by conventional history and since these early modern times were still influenced by the age of Pisces, a patriarchal age, most scientists were male. By and large these men were not beholden to a particular interest group such as a financial supporter, but were able to explore the natural world with abandon and without fear of retribution of their peers. On the other hand, it is likely that there was one special interest group whose needs may have fell upon a married gentleman scientist, namely his wife and family. Obviously, other scientists would perhaps be jealous or critical of a fellow scientist who has made a recognized discovery, but since the scientist of note was operating on “his own dime”, this nor the needs of his family, were not necessarily a hindrance to the quality of his scientific work. Some examples of early notable gentleman scientists would be Charles Darwin: evolutionary theory, Henry Cavendish: discoverer of Hydrogen, Robert Boyle: one of the founders of modern chemistry. Henry Talbot: developed the precursors to the photographic process. Of course one has to mention the free thinkers such as Buckminster fuller: the buckyball and Philo Farnsworth with his early work in developing the television. There were gentle-women scientists too, such as Marie Curie: a Nobel Peace prize recipient who did pioneering research on radioactivity and Dorothy Hodgkin, another Nobel prize beneficiary, credited with the development of protein crystallography. Plus there were women like Jane Goodall the anthropologist considered to be the world’s foremost expert on chimpanzees. Whether or not a scientist was a male or a female, those early-modern days (1500 – 1800) had a kind of innocence about them that was protected by the difficulties of far-travel and communication. These were the days even before the telephone, when inter-continental travel was by ocean-going steamships requiring almost a month to transit from the U.S. east coast to England and commercial airline travel was only possible a hundred years later. A scientist in those times was therefore less encumbered by a political or cultural climate, thus exempted, had the privilege to draw his or her own conclusions. Fast forward 100 years. The condition of today’s modern society, has changed the face and mind of the men and women science. This is partially due to the hold that the banking industry has on our medium of exchange: money, driving up the cost of goods and real estate putting pressure on to perform. Also, the massive growth of international corporations and government-supported University education, the two now entwined, over-focusing scientific study due to selfish corporate interests. Of course the U.S. military has tightened its dastardly grip on patents preventing many wonderful new innovations from benefiting the public at large and at the same time has driven scientific work towards the attainment of the advantage on the field and skies of war. Police-states and the proliferation of laws, lawyers and the courts have become the extended hand of the avaricious corporations and the very wealthy and powerful. Finally, scientific peer review organizations such as the various academy of science bodies and the old Royal society, the mainstays of the scientific status quo, are now controlled top-down by the corporations, governments and the military as well. Today, there is hardly room for the gentle-person scientist, east or west, and the nearest equivalent of a gentleman/woman scientist is referred to as a: “Citizen Scientist”. The Citizen scientist are considered laymen, but doing essential environmental work that governments and corporations are either refusing to do or avoiding. Our various cultures have swallowed the bitter pill of subservience to the governmental and corporate monsters. Governments of the world are corrupt and cannot stand alone against international corporations save perhaps, few: Iceland (threw out the banks) and Norway (government is highly oriented to the welfare of it’s people). Of the new influx of scientific minds, I am sure there are many exceptions to the corporate-scientist. I firmly believe that the men and woman in the field gathering data are still just as starry-eyed as those in their private labs back in the day. Yet data has to be collated, studied and results be re-applied in a lab or in some controlled environment and these facilities are owned by governments and the corporations….. Here is evidence of what I am saying, a new opinion piece at National Geographic declaring that science is running out of things to discover. This latter story is clear evidence of the results when allowing corporate meddling in science. Here is an article at the National Post exposing the degradation of modern scientific journal publications, apparently anyone can “publish” any quality of scientific work for $500. This is the unfortunate truth of modern-day scientific work: a hostile environment for the purity of scientific thought and exploration of new ideas. Flashing back to this early-modern period, it was then that fellow gentleman scientists independently discovered aberrations in the orbits of the outer planets that lead to the discovery of Planet X, but societal conditions underwent massive changes in the meanwhile. So, it is ironic, that due to erosive sea-changes in the freedom of expression of modern society, now the gentleman scientist has not only faded from existence, but his gradual replacement by the corporate-government scientist, cannot report on Planet X which is standing on the ecliptic at this very moment. 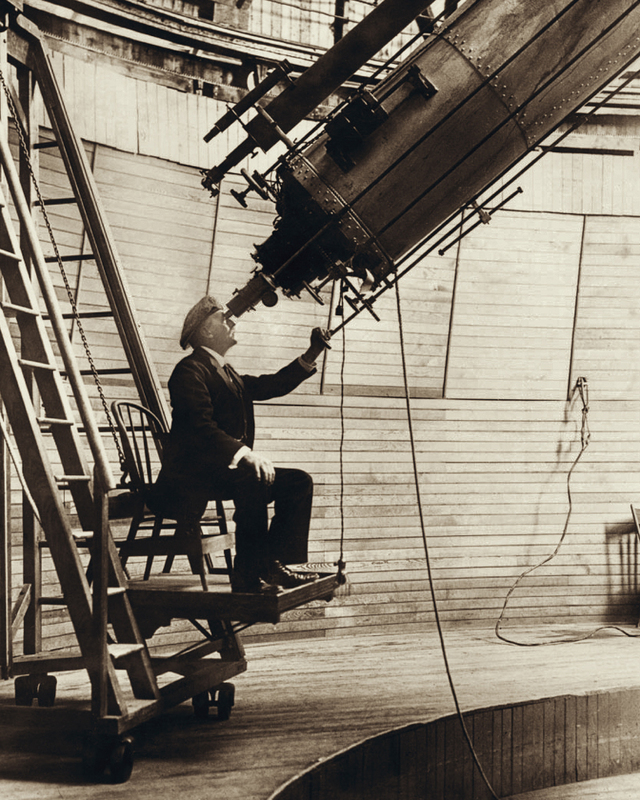 1914 – Persival Lowell at 59 observing Venus during the day with his Clark refracting telescope in Flagstaff Arizona. It was in 1906, when another wealthy gentleman scientist: Percival Lowell, continued to seek the cause of the orbital perturbations of the outer planets of Uranus and Neptune started by his predecessors Adams and Leverrier 76 years earlier. Lowell virtually built his own astronomical observatory in 1894 to look for Planet X. Certainly such an investment is not a casual intention, but it reveals a determined heart and a keen and persistent mind. Although he died in the fall of 1916 failing to find his elusive planet, he is credited with it’s modern name: Planet X. However, if you read about Lowell’s drive to discover Planet X at Wikipedia.org, you would think that the man was a fool and a dullard to spend his remaining 23 years looking for his Planet X. However, this was a man who’s initials (P L) have been combined by the astronomical community to denote Pluto and therefore the name of Pluto: ….which in anyone’s books is a great honor. This belittling is also true of the work of Zecharia Sitchin who wrote “The 12th Planet“, an amazing book which points to the existence of Nibiru (Planet X) and the Annunaki who use Planet X as a home. When one observes the disparaging viewpoints of the elite hierarchy against the works of Lowell and Sitchin, there is clearly a deep disconnect considering the public’s open-armed acceptance of the works of these two men. In these times, much of the public accesses information such as history, science and news via the internet, within a few seconds one can explore almost any subject with a few mouse clicks. The advent of the Internet vastly improved many aspects of the lives of those who could afford to own a computer and access to Internet, but there is a massive problem that developed in the interim. First, let’s consider the book. There was a time when one had to go to a public or a University library and spend many hours pouring over reference texts, published scientific works and newspaper articles to research a subject. A book, once printed and published, provided anyone who could read the information therein. It is no wonder that the powerful factions of the day would burn books they didn’t want the public to read. With the internet, the content of a webpage can be altered at any time, even anonymously. This is the problem. In my 6 and a half years of researching and reporting on Planet X, I have seen many blatantly false reports on subjects, even at Wikipedia.org. Also, many articles relating to NASA’s activities in space that support ZetaTalk have simply disappeared, when at the same time, articles on an unrelated subject of a similar age are still available. So we know it’s not about the age of an article, but about the subject. Today, since the subject of Planet X and the Pole-Shift is censored, it remains for the interested party to determine the truth about Planet X. But how does one do that without the concern of disinformation poisoning the soup of knowledge? The first place to look for the truth about Planet X would be the ZetaTalk website. Nonetheless, this website is massive and requires a great deal of patience to wade through, hence the reason why I write on ZetaTalk. On the other hand, ancient texts go right to the point: the Christian Bible and the Qu’ran (Koran) for instance have many references to Planet X and the Pole-Shift. Edgar Cayce, Mother Shipton and many other prophets have predicted the appearance of a second sun and a Pole-Shift. Cave drawings and rock carvings from many different ancient cultures have also indicated the same, but when is the Pole-Shift due to occur? Obviously, given the state of Human development and spiritual protocols, humans are not to know the date. Yet the actual Pole-Shift (PoleShift) date is not necessary to know anyway, since Planet X will show himself many weeks before the Pole-Shift. So the reality is we need to educate ourselves as to what form the appearance of Planet X will take. There are pre-conditions to the nearby passage of Planet X, such as sporadic global-wide dusting of red dust from the trash-cloud of Planet X, but that is only days prior to the Pole-Shift. Probably the most obvious will be the “tipping” of Earth, with the famous ancient accounts of the “3 days of darkness” and the “6 days of sunrise west” (for most people in the northern hemisphere), certainly the latter would be within weeks of the Pole-Shift. Now since we are preparing for a pre-industrial, agrarian lifestyle after the Pole-Shift, we need the time and money to buy what we need. We need a safe location to ride-out the Pole-Shift, and we need a safe-route beforehand to get there, so much thought and planning needs to be applied. Therefore, for those who require visual proof of Planet X, they will need to keep an eye on the skies for the first appearances of a “second sun” visible by the naked eye. 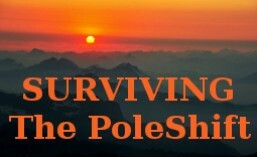 For those others who are already convinced of the imminence of the Pole-Shift, they are either already prepared or are preparing now. Planet X and Pole-Shift information is based on ZetaTalk. Art is by Chris Thomas.